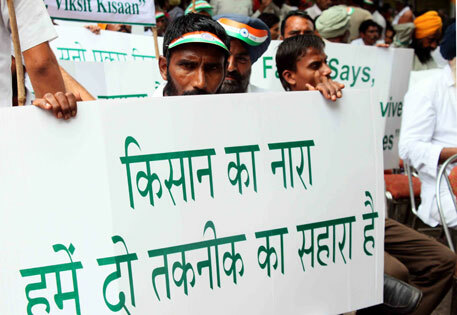 Earlier this month, farmers from across India protested against genetically modified (GM) crops near Parliament in Delhi. On Thursday, it was the pro-GM activists who took turn to stage a protest. Over a 100 farmers from various states, including Andhra Pradesh, Punjab and Maharashtra, gathered at Jantar Mantar, demanding introduction of genetically modified crops in the country. At present, Bt cotton is the only genetically modified crop allowed to be cultivated in India. The farmers said biotechnology is important for Indian agriculture and will help to increase productivity. They protested against the recommendations of the Technical Export Committee (TEC) formed by the Supreme Court to address issues related to genetically modified crops. The six-member TEC was set up by the Supreme Court in May, 2012 during the course of hearing a public interest petition filed by activist Aruna Rodrigues and others against the release of genetically modified organisms (GMOs) into the environment. The court asked the committee to scrutinise the modalities of GM crop testing in India and assess whether the regulatory measures were adequate to prevent potential risks to the environment. Addressing the protesters, general secretary of Consortium of Indian Farmers Association (CIFA) Chengal Reddy said in agriculture, farmers confront several challenges like low productivity, lack of farm labour, high labour costs, insects, weeds diseases, unpredictable weather and nutrient availability. GM crops can offer several solutions to farmers’ problems. He added that biotechnology is a science and farmers have the freedom and right to choose this technology. Criticising the court appointed TEC report, Reddy said five of committee members have failed to recognize the significant contribution of technology to Indian agriculture and economy, citing Bt cotton example which has increased production in the country. The farm leader added that in other parts of the world, farmers have freedom to enjoy the benefits of seeds with built-in protection against harmful insects, herbicides and weedicides. They are able to grow crops with less water, use fertilizer and nitrogen more efficiently, which gives an advantage in times of climate change, erratic weather and scarce irrigation water. Dinesh Govindrao Sharma, farm leader of Maharashtra-based Shetkari Sanghatana, said depletion of resources like water along with climate change is mounting a huge pressure on farmers. He said agriculture contributes to 13.7 per cent in India’s GDP and employs 51 per cent of country’s population. To reduce poverty, there is a need to increase agricultural productivity and agricultural income. The mode to increase productivity is through the use of technology which will be beneficial for Indian farmers, Sharma said. P S Pangli, secretary of Punjab Agricultural University Kisan Club said technology has benefitted the country in many ways, be it Information Technology, manufacturing or communications. It would be unfair to deny India’s farmers the benefits of biotechnology, and it would be unfair to the nation to prevent its farmlands from prospering more, he said. He added that India needs to grow more to ensure that every citizen can eat a nutritious meal, and every farmer can prosper. The rally was led by CIFA and other organisations that participated in the rally included Shetkari Sanghatana, Punjab Agricultural University Kisan Club, Naujawan Kisan Club, Nagarjuna Rythu Samakhya and Pratapa Rudra Farmers Mutually Aided Coop. Credit & Marketing Federation and others.